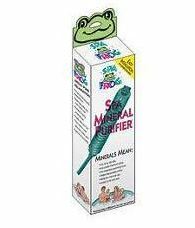 M ineral sticks by Frog, Nature 2 and Leisure Time are cartridges that insert right into the filter compartment and allow for a reduction in chemical sanitizer. Although the mineral stick does not replace bromine or chlorine, quantities of the sanitizer can be reduced when using a mineral stick. The mineral stick helps kill bacteria by dissolving trace amounts of mineral material into the water while being odorless. It works by producing positive ions that destroy negative charged bacteria cells. Most mineral sticks work together with a built-in ozonator to help reduce bromine or chlorine needed. Just put the cartridge in the filter housing area, it does not need to be mounted. Never mount a mineral stick inside the plumbing of a spa. Some filters will allow for the stick to go inside the filter if the filter is longer than about 7″, but just putting in the housing or in the filter basket area is adequate. Replace the stick every 3-4 months. Keep your water safe, free from harmful bacteria and sparkling clean with a mineral stick in addition to reduced amounts of chlorine or bromine. That means less chemical smell and less skin irritation. Never mix bromine and chlorine. 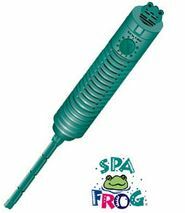 The frog mineral stick is green, like a frog and fits right in the filter compartment of most spas. Follow the directions by snapping off the end and inserting into filter cartridge area. This works with spas up to 1,000 gallons. One stick will last 3-4 months.